Superintendent Jason Viloria swears in returning board members Carol Normandin (left) and Dee Perry during the Dec. 11 board meeting. Photos courtesy of LBUSD. The Laguna Beach Unified School Board reorganized at its Dec. 11 meeting, with two of three newly elected board members sworn in. 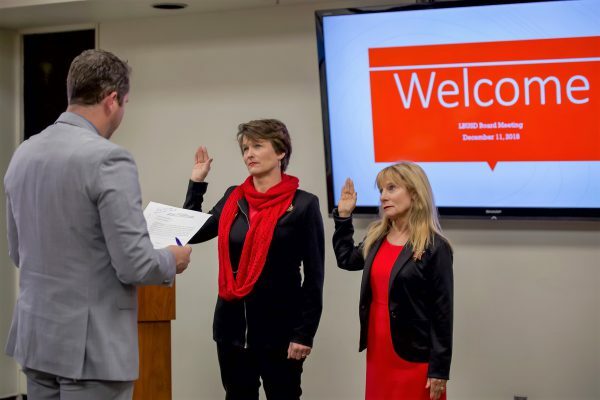 Incumbents Dee Namba Perry and Carol Normandin were sworn in for a new term. Normandin took the majority of the votes on Nov. 6 (5,923 votes, or 21.9 percent of the vote) while Perry came in second with 5,695 votes (21 percent of the vote). Newcomer Dr. James Kelly, who earned the third board seat with 5,546 votes (20.5 percent of the vote), was unable to attend the meeting. During the reorganization portion of the meeting, Jan Vickers was elected to continue as board president and Normandin was elected as clerk. Kelly is filling the seat vacated by retiring LBUSD board member Ketta Brown. According to teachers, board members, and administrators, Kelly has big shoes to fill. First elected to the board in 2006, Brown teared up as she bid farewell, saying it was an honor to serve the community for the last 12 years. “This job has been a joy,” Brown said as she thanked the board during her final meeting on Nov. 13. 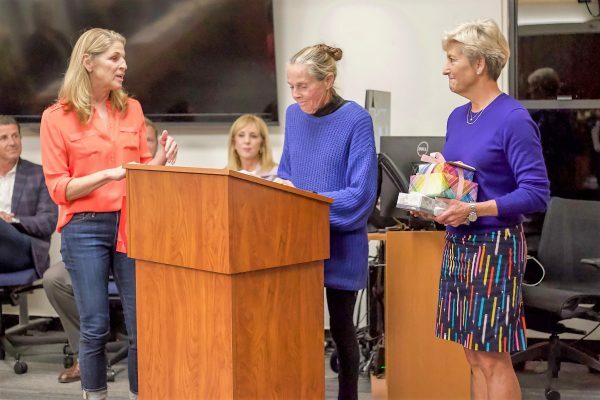 Board member Peggy Wolff (left) and board president Jan Vickers (center) gave two of the speeches honoring board member Ketta Brown during her final board meeting on Nov. 13. In a series of speeches, Brown’s co-workers praised her character and commitment. “You have made a difference and that is your legacy,” board president Jan Vickers said. Superintendent Jason Viloria lauded Brown, saying she always asked the right questions. LBHS English teacher Dawn Hunnicutt described Brown as someone with a big-picture perspective. “The true meaning of life is to plant trees under whose shade you do not expect to sit,” she said. “You have planted a forest,” Hunnicutt told Brown. Brown’s replacement, the retired president of Menlo College, has lived in Laguna for over 30 years. Before his tenure at Menlo, Kelly spent 27 years in the Cal State University system, including roles as dean and interim provost. Kelly said that civility is one of his top priorities. Perry voiced a similar wish for communication and teamwork. Perry has been on the board since 2014. Having spent over 30 years working for LBUSD as a former elementary school teacher, special education teacher, and speech pathologist, she has seen the inner workings of all four Laguna schools. Perry said her experience has given her a unique insight. Normandin, who also began her board tenure in 2014, is a former trustee and executive board member of SchoolPower. Normandin’s campaign stressed fiscal discipline, an innovative curriculum, and the need for continuous improvement.